Amazing! We just wanted to thank Matt, Lauren and Samantha for managing the rental, and recent sale, of our Tahoe Donner home over the past four years. Their local knowledge, experience, advice and support, as well as prompt response to all our concerns, made for a very stress free time for us all these years. It was especially important, being a long distance away, to have a team we could trust to keep us informed and make the right decisions for the property in our absence. We wouldn’t hesitate to recommend Tahoe Truckee Homes for the sale or property management of your home. 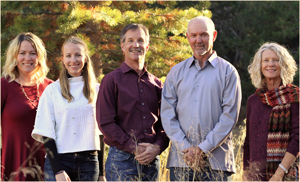 "Thank you for all your help in finding and then purchasing our new home in Tahoe Donner. Trying to do this from 3000 miles away was frustrating until we... continued"
- Dennis & Judy D.